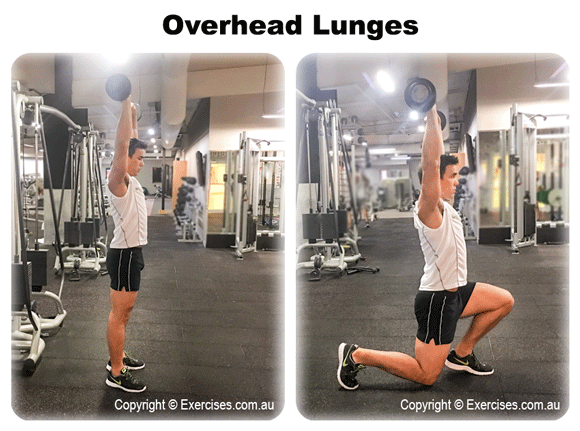 Overhead Lunges is a variation of the regular lunge exercise and builds the quadriceps, gluteus, hamstring muscles and calves. Because this exercise requires you to lift a weight over your head and maintain its position with both arms extended, secondary emphasis will be on your shoulders. Your core muscles will also be activated to keep your abdominals tight and support the lower back. Overhead Lunges requires a great deal of stability, balance and coordination which means you should not use heavy weights with this movement. This exercise will benefit your performance in sports such as football, tennis, rugby, soccer, sprints, fencing and basketball where hip, knee and core stability are very important. Get a barbell plate and press it over your head. Your hands should be in line with your shoulders, hips and the heel. Your feet should be at hip width. Keep your glutes and core muscles tight when the barbell plate is pressed overhead. Inhale then lunge your right leg forward. Make sure your right shin is vertical and that the right knee does not go over your right foot. At the bottom position, your left knee should touch the ground and remain in line with your left shoulder and left hand. Exhale then push off the right foot and return to the standing position. That is one rep. With Overhead Lunges, you can do alternate leg positions or one leg position per set. Maintaining body alignment and foot placement are critical areas of Overhead Lunges. Again, this is not an exercise where you should use heavy weight. Use a barbell plate that you can balance comfortably over your head for an extended period of time. Make sure the knee of your lunging leg does not extend past the foot. Otherwise this will place undue stress on your knee especially when you push off on the rebound.